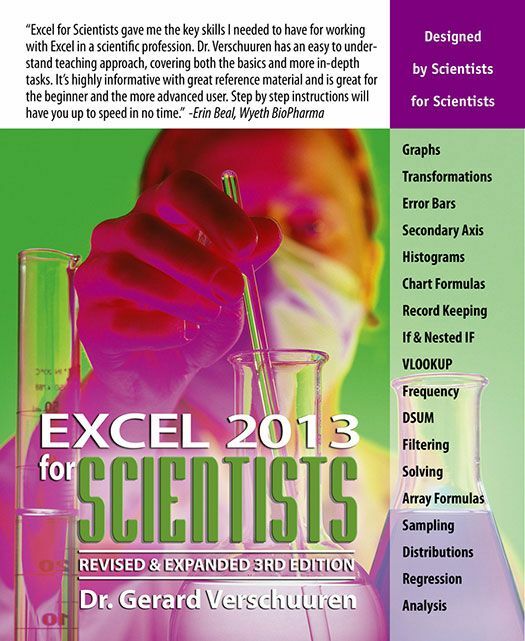 Teaches scientists how to create graphs, analyze statistics and regressions, and plot and organize scientific data. With examples from the world of science, this reference teaches scientists how to create graphs, analyze statistics and regressions, and plot and organize scientific data. Scientists can learn the tips and techniques of Excel—and tailor them specifically to their experiments, designs, and research. They will learn when to use NORMDIST vs NORMSDist and CONFIDENCE vs Z, how to keep data-validation lists on a hidden worksheet, use pivot tables to chart frequency distribution, generate random samples with various characteristics, and much more. Ideal for students and professionals alike, this handbook will enable greater productivity and efficiency and it is updated to include all new functions in Excel 2010 and Excel 2013.